This is an engaging story told in five short chapters, with super illustrations supporting the text well. Hamda is the youngest of five sisters and is dejected when each of them turns down her request to join in whatever activity they’ve planned for themselves, because, so they say: ‘You’re too little.’ She announces one day that she’s discovered what makes them big girls: they wear the veil when they go out, ‘and I’m going to wear it too!’ she states triumphantly at the dinner table. But putting one on and keeping it from slipping off is not easy as she thought it might be, and there’s a dash of light humour which leaves us bemused at Hamda’s clumsy but cute attempts at tying a scarf in the various ways her sisters suggest one by one. 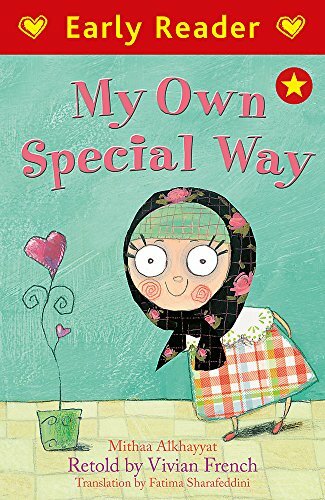 Hamda’s expressions and reactions are captured charmingly in the illustrations, drawing a smile and some sympathy from the reader. Her family reassure her that she’ll find ‘her own special way’ and so she does. Triggered by seeing her dad’s shirt sleeve being fastened by a cuff link, she has the idea of using a pin to clip her scarf in place.